The move to deploy yet more tanks and armored vehicles was welcomed by Latvian Minister of Defense Raymond Vejonis. "The presence of our allies (US and NATO) in Latvia is a confirmation of solidarity and security in the region," Vejonis said in a statement on Twitter. 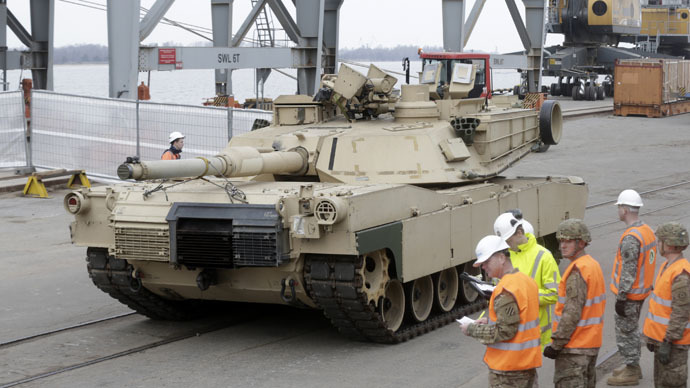 The tanks were delivered to Latvia via Riga Freeport after being offloaded from the carrier ship Liberty Promise on Monday. US Army General John O’Conner who witnessed the tanks arriving on Latvian soil said, “Freedom must be fought for, freedom must be defended," as reported by the US Embassy Riga Twitter feed. He also added their delivery would "demonstrate resolve to President Putin and Russia that collectively we can come together," while General O’Connor also mentioned, they would stay "for as long as required to deter Russian aggression,” as reported by AFP. Following the secession of Crimea to Russia, the US has been keen to boost its presence in the Baltic States and Poland to help guard against ‘perceived’ Russian aggression. There are currently more than 150 American troops in Latvia. On March 6, NATO forces carried out drills with their Latvian counterparts. As part of Operation Atlantic Resolve, Canadian and American soldiers, in cooperation with their Latvian partners conducted exercises in winter conditions. These included training to spot enemy positions as well as calling in indirect fire support. They took place at the Adazi training grounds. Similar drills also took place in Poland. Live-fire training exercises were conducted at Drawsko Pomorskie in the north of the country, while troops from Poland's 12th Mechanized Division were also involved. The ‘temporary’ deployment of US troops in Poland and the Baltic states has been extended through to 2015, which was confirmed by a spokesman for the US Embassy in Poland. A 1997 Russia-NATO agreement forbids the alliance from having troops permanently stationed in the Baltic States, so the deployment remains a temporary mission. However, it’s not immediately clear when, if ever, NATO would consider the ‘perceived’ threat of Russian aggression is no longer valid and would withdraw the troops. Drills incorporated into Operation Atlantic Resolve have been taking place since April 2014. The US is keen to expand the operation from the Baltic to the Black Sea. Romania and Bulgaria have already joined to create a ‘southern’ flank, while Hungary, the Czech Republic and Georgia could also agree to take part, according to a US Army official spearheading the effort. "So by the end of the summer, you could very well see an operation that stretches from the Baltics all the way down to the Black Sea," said Colonel Michael Foster, of the 173rd Airborne Brigade, which is based in Italy. "As you connect countries, there is almost a line of US troops," as cited by Defense News on March 2. Russian Deputy defense Minister Anatoly Antonov says Allied forces are ignoring diplomacy and NATO is using the situation in Ukraine to push closer to Russia's border. However, he dismissed drills being carried out in the Baltic States, Poland and the Black Sea were a threat to Russia. "Instead of uniting forces to fight evil, the worst of which is terrorism, Western nations are drawing new divisive lines, trying to realize containment schemes against unwelcome states. Today, Russia has been chosen as the target,” Antonov said on March 5. He cited another example of a NATO military parade on February 24, held just 300 meters from the Russian border, in the Estonian town of Narva. About 140 pieces of armor and 10 times as many troops, including US soldiers, took part in that event. Moscow saw it as a stab in its direction, but Estonia defended its right to host a parade, saying it can move military whichever way it likes on its territory - the same argument used by Russia when accused of military build-up along its borders. A freight train carrying a whole column of American armored vehicles was caught on camera in Latvia in December. Dalbe Railway Station, where the train was reportedly spotted, is less than 300 kilometers from the Russian border. The train was carrying at least 38 vehicles and several semitrailers, including eight Bradley Fighting Vehicles, nine M113 Armored Personnel Carriers (APCs), four petrol tankers, Heavy Expanded Mobility Tactical Trucks (HEMTTs), High Mobility Multipurpose Wheeled Vehicles (HMMWVs), an M88 Hercules Armory recovery vehicle, a couple of trucks, some tactical engineering and medical vehicles, at least four containers and a pair of railcars with ammunition. NATO are not only bringing their own tanks and armored vehicles to the Baltic States. They are also pushing Latvia, Lithuania and Estonia to purchase weapons from richer allies. Estonia recently negotiated the acquisition of the $55-million Javelin anti-tank missile system. It has also signed what’s been described as “the largest procurement contract ever" for purchasing 44 infantry combat vehicles worth €138 million ($154 million) from the Netherlands. Latvia is splashing out more than €54 million ($60 million) on a package that includes 123 British combat vehicles. Lithuania bought a €34-million ($38 million) GROM air defense system from Poland in September.